HAMPSHIRE bid to qualify for the English County Finals for the fourth year in a row when they travel Essex for the South East Qualifier. And captain Colin Roope has been boosted by news Billy McKenzie is available. Now the county's No1, the Rowlands Castle ace made his debut for England against France in May. 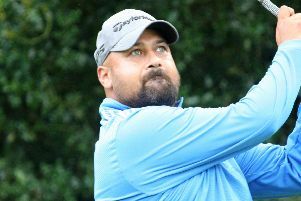 But while the national team will take part in this week's European Amateur Championship, McKenzie will be with Hampshire as they bid to claim the South East title for the ninth time since 2002. Having taken over from Brokenhurst Manor’s Martin Young, who led Hampshire to the English County Championship last September, Roope - who left himself out of the South East League team that beat Sussex this month to maintain Hampshire’s unbeaten record in 2018 - will again sit out and watch on from the sidelines. And that's because, behind McKenzie, he has arguably the strongest side on paper of all his predecessors. As well as Young, Tom Robson is playing for the seventh time since his debut in the 2012 qualifier. He knows what it takes to go low after his Peter Benka Trophy success over 36 holes five years ago. Meanwhile, Meon Valley’s George Saunders has been in the best form of his life. He finished third in The Berkshire Trophy last month, having won the West of England Amateur Championship in April. Hampshire will be hot favourites to reach the English County Finals at Suffolk’s Aldeburgh in September. Of the counties involved, Berks.Bucks & Oxfordshire also have a strong team on paper, while Kent will be keen to complete a rare double, having won the South East Boys Qualifier at Blackmoor last week.